Sam has gone on a much deserved road trip down and up the East Coast so it’s my turn to update the blog. What a summer! August passed in a blur. We had lots of visitors to our seaside village. Family, friends and… did I say family?? It was wonderful. It was tiring. We were sad and glad to see them go. September blooms on Indian Point Rd. 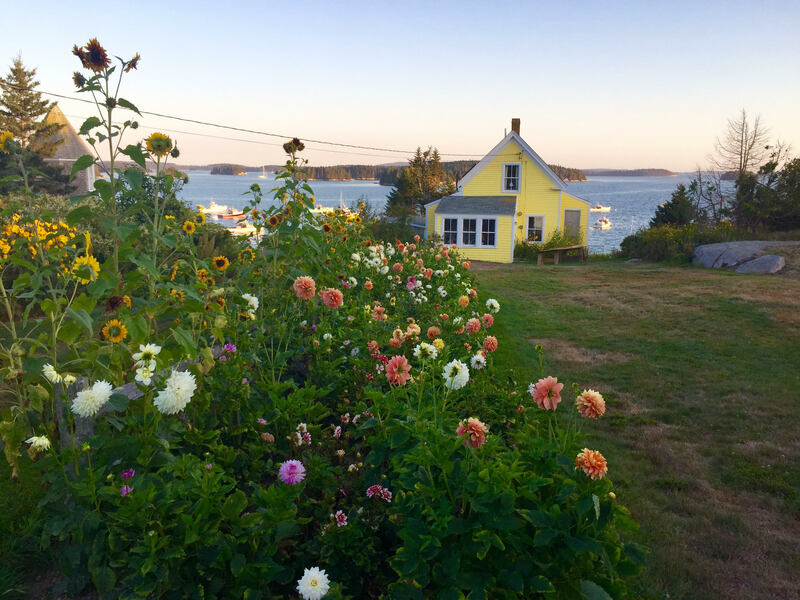 I’m noticing a different rhythm to this blog as we start our third autumn in Maine. There isn’t the same urgency. I’ve noticed and celebrated and lamented and grieved for much of what is here… or not here. And I worry that there isn’t more to say. But I don’t think that’s true. The coast of Maine is rich with beauty and possibilities. Painters like Edward Hopper (see link below), John Marin, Georgia O’Keefe, Fairfield Porter, and Jamie Wyeth, to name a handful, as well as writers such as E. B. White, have been drawn to Maine since the 19th century. 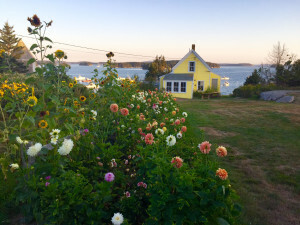 Not to mention our own Jill Hoy (see link below) who paints every summer in Stonington. My sadness over leaving Washington D.C. continues to fade. I am looking forward to a return to Brooklyn, NY later this fall for a jolt of hustle, bustle, grime, congestion, and noise. That would include the delicious chaos of our three young granddaughters who live a few blocks from us when we’re in New York. Note: Although Sam and I spent 32 years in D.C., we are completely new to New York. We are savoring the chance to explore the city from our Brooklyn perch, while also continuing to work and write and visit with the little girls. Our other two grandchildren are too far away, in Sunnyvale, CA. But we’ve scheduled a trip to see them in late October. 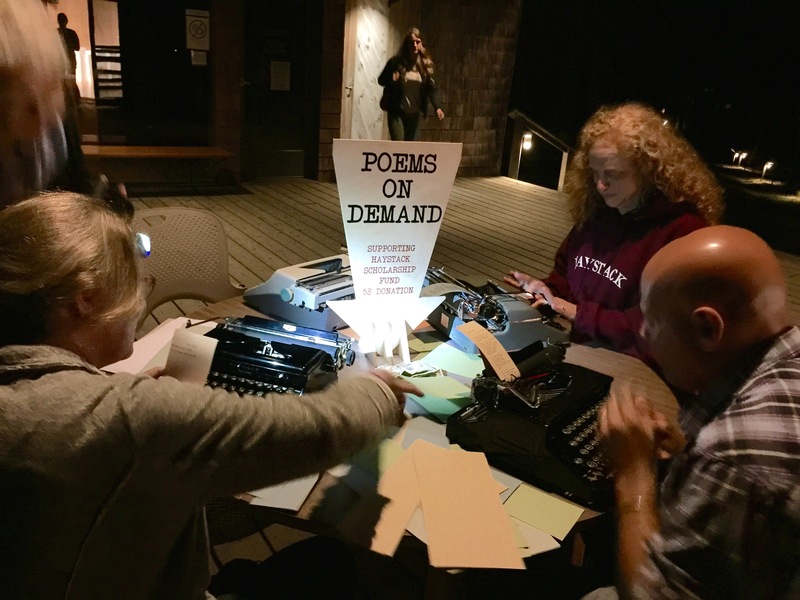 As for writing “Poems on Demand,” that was the final activity of the poetry workshop I enrolled in at Haystack for the second year in a row. Last year’s session was especially rejuvenating after a too busy summer (and a brief period of depression which I wrote about here). Of course, nothing ever plays out the same way. 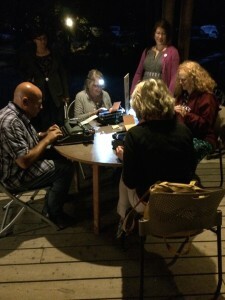 In comparison to last year’s zen-like poetry instructor, Kim Stafford, our teacher this year, poet Rick Benjamin, was filled with manic energy. He settled down by day 3 and we learned a lot that I know surprisingly little about: how to write a poem in iambic pentameter, how to really listen to poems spoken out loud, how to write prompted by the content or structure of a famous poem. The last night of every summer session at Haystack features an auction of works (clay, metal, fiber, paintings, jewelry, etc.) donated by the instructors to raise money for Haystack’s scholarship fund. Rick suggested that we set up a table and offer to write “Poems on Demand” for $5 each. I was skeptical. Who would want a poem created on the fly?? It turned out to be one of the most popular items at the auction. Composing a good poem on the spot is hard to do. But I quickly learned how to incorporate the person’s name, the word love, a few dazzling bays, some granite rocks, and of course spruce trees into something that sounded OK. Sometimes the request was quite personal. One Haystack student sidled up and said she wanted a poem to help her through a time of transition and rebirth. She was going through a divorce and starting a new life. I did my best – in five minutes – and she seemed pleased. That was very satisfying. After all, that’s what poems are for. They inject a bit of free speech and truth into our conversation, they touch the soul if you are lucky, and they are an anchor into the beautiful here and now. Thank you, Haystack – and thank you, Rick – for a wonderful week. P.S. I wrote about 10 poems but they are still germinating and not quite ready for publication.